Billed hats such as baseball caps can be difficult to clean. 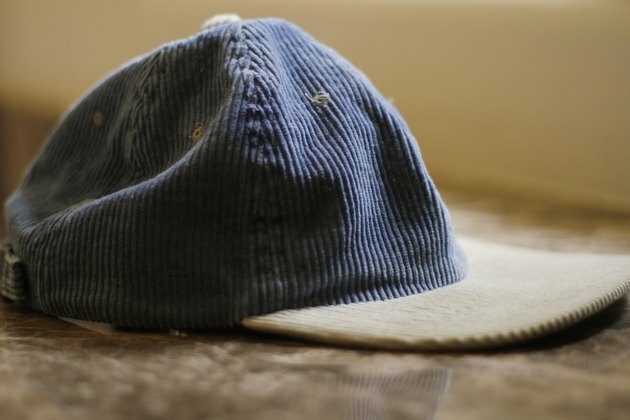 Washing machines often cause the bill and general shape of the hat to become distorted, ruining the hat for future wear. The easiest way to evade this problem is to wash billed hats by hand. 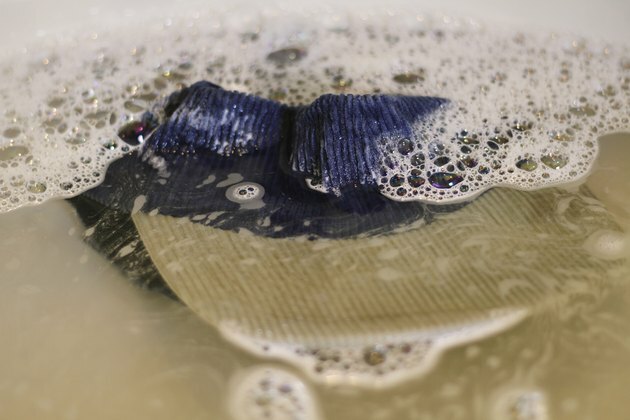 This ensures that the hat's shape will not be destroyed in the washing process because you are in control of the motions that will clean it as thoroughly as if it had been washed by machine. Put on latex gloves. This protects your hands from any potential skin damage caused by working with liquid soap. Place the hat in the sink basin or, alternatively, a large bowl. Fill the sink or bowl with enough water to cover the top of the hat. The water temperature can range from cold to moderately warm. The ultimate cleanness of the hat won't depend on the water temperature. Also, you will be working directly with this water, so the temperature should be at a level that is comfortable for your hands. Add 1 tbsp. liquid soap to the sink or bowl. Swirl the soap and water around. Work the hat with your hands, kneading it, scrubbing at problem areas, squeezing it to ensure that the soap is reaching every part of the hat. Swirl the contents of the sink or bowl around again a few more times for a thorough agitation process. 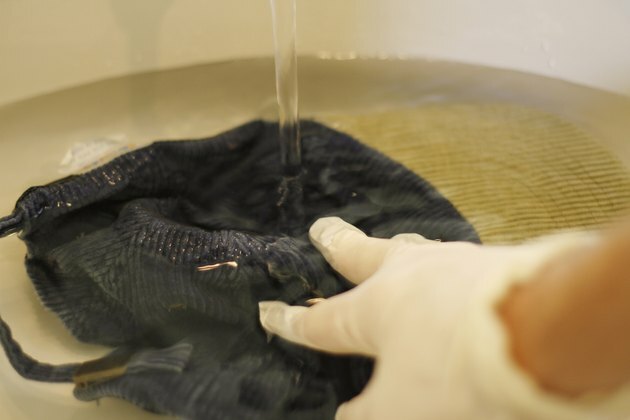 Let the hat soak in the soapy water for up to 10 minutes. Soap stains that will damage the hat's appearance may occur if you allow the hat to soak for an extended period. Drain the water. 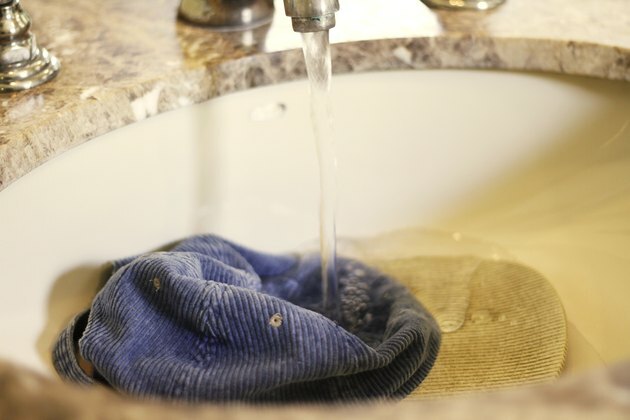 Turn on the sink faucet, again using cold to moderately warm water. Hold the hat underneath while partially refilling the washing container. 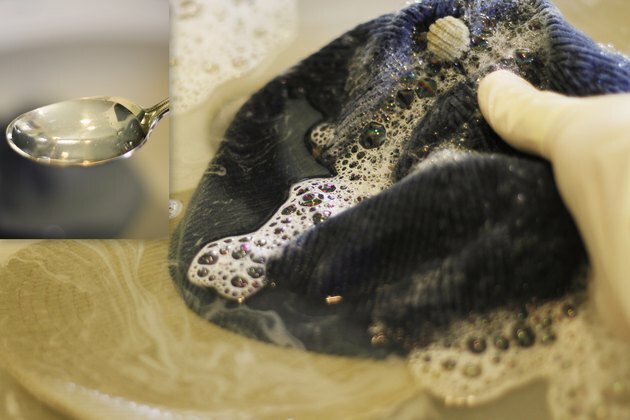 Once it is refilled, place the hat in the water and work it with your hands again, squeezing and kneading it to remove the soap. Lift the hat from the water and wring it out. Repeat this step as many times as necessary to remove all the soap. 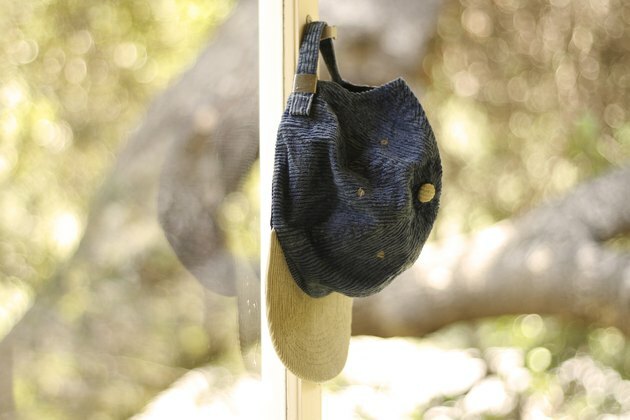 Allow the hat to air dry. You can hang it from a clothesline outside or simply set it on an open surface in a warmer area indoors.